New New Year’s Resolutions | Where's my backpack? No, the title isn’t a typo. New Year is traditionally the time to make changes, and the first things I want to change are my New Year’s resolutions. The most popular resolutions seem to involve losing weight, giving up a habit, getting a better job, making more money. They all seem to imply you are not good enough just the way you are. They are filled with superlatives – bigger, better, faster, louder, smaller, lighter, healthier, smarter, richer. They pile inordinate amounts of stress on you, causing you to deprive yourself of something – food, leisure time, booze – and you are inexorably doomed to fail and in failing feel like a failure. BORING. I’ve been there, I’ve got the t-shirt – and it doesn’t fit any more. Maybe I should lose a few pounds…. no, I’m stopping myself right there. There, I’ve said it. And written it. And published it. So now all I need to do is figure out how to achieve it sometime in 2012. How much fun is that? And when was the last time you were truly excited about trying to keep your New Year’s resolutions? Aurora borealis over Norway. 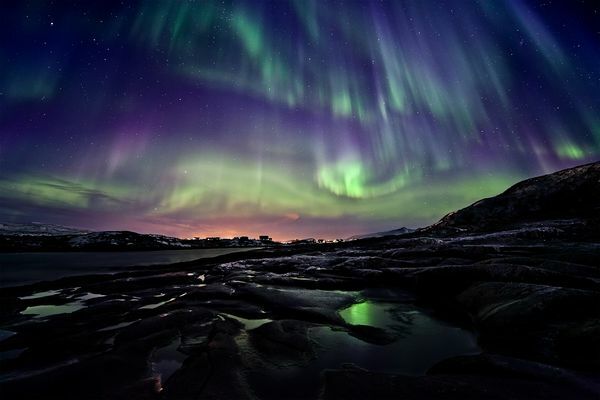 Photo by Ole Christian Salomonsen, runner-up in National Geographic astronomy photos of 2011. This entry was posted in Photography, Travel and tagged 2012, holidays, humor, photography, photos, pictures, postaweek2012, travel, writing. Bookmark the permalink. I cant wait to see your Aurora borealis photographs here. Love it, Gillian, sounds like a fantastic resolution to me. Take lots of photos on your cycling tour and post them on your blog! Your enthusiasm is infectious! I’m going to get out my map of Ireland and start planning! I think it should include county Offally, I remember some good flat bits there! Bravo for you! I think that being content with oneself is the key to a happy life. Having gotten that out of the way, I think that seeing the Northern Lights is indeed a most worthy goal! I look forward to your images. Outstanding resolution! 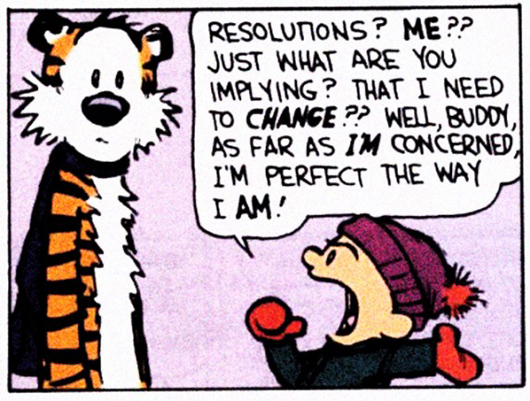 (And I love Calvin and Hobbes, so, well done there as well!) Like Gillian and xinapray, I’m looking forward to your photos. let me know if you want some company! So, how far north are you planning to go: via the shortest route, as the crow flies (; ) straight up to James Bay? LOVE the photo BTW. Aren’t they just magical? Sometimes I swear that you can almost touch them. Good luck on your quest! You got me thinking so I went looking and, when I came across this, “Weather permitting, northern lights displays will be visible directly overhead from Dawson City to Watson Lake and visible to the north from Whitehorse.” ( courtesy of http://www.auroraborealisyukon.com/auroracast/ ) , I thought, “What if you followed the gold rush trail on your quest for the Aurora? Cool eh, throw in some great history while you’re at it? Hi again! Figured there HAD to be something better on this from a government website. Your Aurora Buffs just have to check this out: a live web cam from the Canada Space Agency. Love it, and what a great photo. I think New Year’s Resolutions should be inspirational, just like yours, and it doesn’t matter what time of year they’re made.